"Something Old and Something New"
Cozy Historic and Honeymoon Cabins in the NC mountains! Our Vacation Cabin Rentals are on Lake Lure, NC near Asheville & The Biltmore House in the Western North Carolina Mountains. We are only one mile south of Chimney Rock Village and Chimney Rock State Park. Pine Gables is located at 328 Boys Camp Road on a relatively flat tract of land in the Hickory Nut Gorge area of Rutherford County, North Carolina, in the present-day town of Lake Lure. The site is situated near an early Cherokee trail connecting the Blue Ridge of North Carolina with the Piedmont. This trail was later used as a stagecoach route and is now a paved road that runs northeast of US Highway 74A. The gentle topography and grand picturesque views of Chimney Rock, Shumont Mountain, Rumbling Bald Mountain, Roundtop Mountain, and Sugarloaf Mountain made this site along the old road perfect for an inn and cottages catering to both commercial transport and tourist travel. The nominated tract is 9.31 acres and includes all the existing buildings and structures associated with Pine Gables. The landscape of the nominated property includes large areas of grass lawn, various large trees, a bamboo thicket, flower gardens, a circular rock fountain, rock walls, three ponds, gravel drives and over eight hundred feet of Lake Lure shoreline. The nominated property consists of eight contributing resources (the old inn, one stone structure, five guest cabins and one tearoom), and four non-contributing resources (three guest cabins and one craft shop). South of the old toll road (now Boys Camp Road) stands the old inn at Pine Gables. The inn is a two and one half story frame building encompassing two log structures. The two story log structures of the saddlebag variety (two log houses built on either side of a large chimney) have been raised to two and one half stories and weatherboarded. Presently there is a two story shed porch built on the south side and a two story principal roof porch on the north side. The principal roof is a 12:12 pitched side gable sheathed with a five "V" metal roofing. Towards the south are two cross gable dormers. Towards the north are two cross gable dormers and one shed dormer. The upper porch on the north side displays fine nineteenth century porch sawn-work. The facades sheltered by the porch areas have flush beaded sheathing. The upper north porch houses an exterior stair to the third floor. This stairway runs to a landing where there is a stairway to the east and another to the west. At the end of the east and west stairways are doors to the third floor rooms. From the west stairway there is an open walkway to the center shed dormer. door surrounds are plain milled boards with no molding. Corner boards and fascia are of the same simple millwork. Twenty-seven of the forty windows are four over four single-hung wood sash windows. The remaining windows include: one six pane fixed wood sash window on the second floor east side, one nine over six single hung wood sash window on the east side third floor, one six over nine hinged wood sash window on the west side third floor, three hinged four paned wood sash windows at the shed dormer on the north side third floor, two six over six single hung wood sash windows at the south dormers on the third floor, one three over three double hung window on the south side first floor and three six paned wood sash windows at the foundation (one on the west side and two on the east side). On the north side, eight of the four over four wood sash windows form three bay windows. One bay window is on the first floor and two on the second floor. The two exterior doors at the first floor north porch are two paned four panel. Two exterior doors on the second floor north porch are five paneled, one is two paneled and one is two pane five panel. The exterior door on the east side is five paneled. Two exterior doors at the south side first floor porch are twelve pane French doors and two are ten pane French doors. One exterior door at the second floor south porch is twelve paned and one is five paneled. unused (one on first floor towards the west and two on the second floor) that connect to the large center chimney. This one-story timber-frame building with metal hip roof has shingle siding from the top of the foundation up to three feet in height then German siding with four paned wood sash windows to the roofline. Originally built as a dance pavilion, it was open above the shingled parapet wall. It was remodeled into a tearoom, and later as a camp cafeteria/infirmary. This building is presently used as a year round single family dwelling. This one-story stone structure with a prominent brick chimney was purportedly used to heat water for the inn. The structure was later used by Jim Washburn (ca. 1948) to cure hams. The structure is laid in irregular courses with interior brick walls and slightly pitched concrete roof. The structure is accessed through a brick-lined arched entrance and metal door with cast iron hinges. gable roof. The attached shed-roof porch is supported by log posts. The cabin features four over four double hung wood sash windows and board and batten siding at the gable. This cabin is currently used as a guest cabin. Pine Gables (also known as the Logan House, the Red Coach Inn and Harris Inn) was an early way station for stagecoach travelers and cattle drovers passing over the road connecting Rutherfordton and Asheville. The nominated property is located on a relatively flat tract of land in the Hickory Nut Gorge area of Rutherford County, North Carolina, in the present-day town of Lake Lure. The site is situated near an early Cherokee trail connecting the Blue Ridge of North Carolina with the Piedmont. This trail was later used as a stagecoach route and is now a paved road that runs northeast of US Highway 74A. The gentle topography and grand picturesque views of Chimney Rock, Shumont Mountain, Rumbling Bald Mountain, Roundtop Mountain, and Sugarloaf Mountain made this site along the old road perfect for an inn and cottages catering to both commercial transport and tourist travel. The Pine Gables property is significant under criterion "a" for its role in the formation, settlement, and economic development of western Rutherford County. This property was also the home of prominent and influential individuals, and as the way-station for a host of mountain travelers for over 190 years. The nominated property is significant under criterion "b" for its association with Dr. John Washington Harris and Judge George Washington Logan. John Harris had the idea for the inn, was a pioneer road builder, early developer, first postmaster for the area and gracious host to many early travelers to Western North Carolina. Judge Logan was not only a prominent innkeeper and farmer, he was very active in local and state politics, Brigadier General of the division of North Carolina Troops and editor of the Rutherford Enquirer. Both of these men played a significant role in the formation, settlement, politics and economic development of western Rutherford County. The old inn of the nominated property is significant under criterion "c". This building began as a log house (ca. 1800) and was transformed, over the years, into a unique and functional two and one half story weatherboarded building. Stageline," which began operations in 1839, utilized this route on its Salisbury-to-Asheville run. Twenty years later the Asheville-to-Charlotte "United States Mail Line" traveled the Hickory Nut Gorge Turnpike and advertised it as "the cheapest as well as the most direct route." Two entrepreneurs, Dr. John Washington Harris and his brother, Zadock Harris were aware of the business potential associated with travel and tourism. These two men built two of the first inns in Rutherford County and were instrumental in developing and the establishment of the early trade routes. Zadock established his inn on what was then known as the "Spartanburg-Rutherfordton Turnpike" in the southeastern part of Rutherford County. Dr. John Harris decided to build in the more remote but scenic western part of Rutherford County. He built at least one of the original log buildings that became known as the Harris Inn (the nominated property) in Chimney Rock North Carolina sometime between 1782 and 1800 on a tract of land he acquired during this period (one of the log structures may predate his ownership). of this family was then locally famous. In ca. 1839, the family tradition of innkeeping was furthered when Dr. Harris' daughter and son-in-law, Mr. and Mrs. Bedford Sherrill, built Sherrill's Inn at the Hickory Nut Gap, ten miles to the west of the nominated property. Assembly re-appointed Dr. John W. Harris, Bedford Sherrill and four other men from Rutherford and Buncombe counties as "Commissioners . . . for the purpose of making and keeping in repair a Turnpike Road". In this act the Assembly incorporated the commissioners as the "Hickory Nut Turnpike Company", empowered it to issue capital stock, set construction standards, and establish rates of toll. The turnpike was completed sometime before May 10, 1847, when it was given a final inspection and presumably opened to traffic. The Harris Inn was used as the tollgate for travelers going west to Asheville. The first post office to serve the Chimney Rock community was established at the Harris Inn (in what is now the kitchen) on December 19, 1843, with John W. Harris as postmaster. By the 1850s, a visit to Hickory Nut Gorge was a favorite excursion for travelers in the Western North Carolina mountains. Already the natural wonders of the area such as Chimney Rock, the Bottomless Pools, Hickory Nut Falls and the grand panorama of the gorge were much admired. Scenery, the Scenery of the Mountains of Western North Carolina (1859) and Guide Book to the Scenery of the Mountains of North Carolina (1860). Mr. Colton obviously enjoyed his stay at the Harris Inn. He states in his first book, "the traveler, at his leisure, can find no better place to rest his weary limbs, or satiate an appetite acquired in the bracing mountain air. An excellent view of the mountains is obtained from this house [the Harris Inn]. In fact, just here is the beginning of the grandest panorama of mountain scenery which is to be found easy of access anywhere in the West". Colton's second book quotes the stagecoach fare for travel from Charlotte to Asheville on the Sullivan line of stages as $9.00. A Whig in politics, Judge Logan was a staunch Unionist during the secession crisis. He kept this position during the Civil War and it determined the rest of his political career. As a member of the Confederate Congress, Judge Logan was one of the strongest opponents of Jefferson Davis and he worked quietly to restore peace and to return North Carolina to the Union. Opponents identified him, probably correctly, as a leader of the pro-Union Red String Order, which was wide spread in western North Carolina during the latter part of the Civil War. The "Red Strings", also known as "the Heroes of America", was created with the aim to bring down the Confederate government. After the war the "Red Strings" actively supported the federal Reconstruction activities in North Carolina. Just as it was in its earliest years the Logan House continued to be a focal point for travelers, tourist and writers passing through this region. It was while staying at the Logan House that Frances Hodgson Burnett (1849-1924) wrote her play, Esmeralda. From the inn one can often see the appearance of a cabin on the rock face of Rumbling Bald Mountain, this, according the local folks, is "Esmeralda's Cabin" and a reminder of Ms. Burnett and her play. Esmeralda became the longest running play on Broadway in the nineteenth century. In 1891 Col. Thomas Turner built another famous inn three miles northwest of the Harris Inn and named it the Esmeralda Inn after Ms. Burnette'e famous play. At about the same time, Charles Duley Warner, a well-traveled friend of Mark Twain, passed through in the 1880s. He made the acquaintance of Judge G.W. Logan and stayed at the inn. Mr. Duley wrote that he enjoyed his stay at the inn but not the Judge's politics. In 1881 Miss Chunn wrote The Descriptive Illustrated Guide-Book to North Carolina. In this book she states, "the trip through the Hickory Nut Gap claims manifold attractions; the Pools, Chimney Rock, High Falls, Bald Mountain, etc., in addition to the wild beauty of the route. It is suggested that several days be given to the pass, making the comfortable farm-house (Logan's) near the eastern end of the gap the objective point". Edwin A. Gatchell toured the area in 1886 and the next year wrote The Standard Guide to Asheville and Western North Carolina. About his trip from Asheville to Rutherfordton he writes, "Continue your trip to Judge G. W. Logan's Hotel, where you will find a hearty welcome, comfortable quarters, and good fare". In 1887 the Seaboard Air Line Railway, a major east-west railway, finally reached Rutherfordton. In a published advertisement titled "Mountainous Regions Western North Carolina" the railway encouraged tourist travel further west. This booklet spotlights the Chimney Rock area and makes reference to the Logan House. In the beginning paragraph of the booklet the author states, "I rode horseback for two days through this section and found a number of boarding houses and hotels, all comfortable places, delightfully situated for summer rest, and pure water piped from the mountains above them and magnificent mountain scenery right at their door. These hotels, as a rule, are very clean, with comfortable beds and good cooking, plenty of eggs, chickens, splendid North Carolina ham, all the milk and cream you want and ample supply of fresh vegetables. There being no frost in the Gap the gardens are very early. Fish are very Plentiful; I got up the second morning I was there and caught enough for breakfast right at my door". 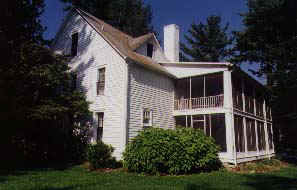 In 1913 author Margaret Worley wrote of her stay at the Logan House: "Crossing a charming, though somewhat deep and rocky ford of the Broad River, you continue on up the beautiful valley, the mountains draw in about you, and you are at "Logan's," a large, old-fashioned farmhouse which was converted to uses of a wayside inn when the road went through to Rutherfordton, connecting the mountains above here with the low country. Logan's is 'in the Scenery,' so they tell you a good many times while there - and unquestionably it is. A beautiful cultivated valley lies about the house enchantingly surrounded by mountains. The mountains of this region, although so individual in form, so picturesque, or so beautiful, are, according to General Logan, worth about a cent apiece, there is so little soil on them". The twentieth century brought many changes for the Hickory Nut Gorge and the Logan House. Dr. Lucius B. Morse and his brothers bought the nearby Chimney Rock Park in 1904. Dr. Morse soon made many improvements to this tourist attraction and the dream for Lake Lure was developed. With several financial backers, Dr. Morse created Chimney Rock Mountains, Inc. and began buying land and options for land around the Broad River below Chimney Rock. Chimney Rock Mountains, Inc. needed a large building to house its offices and in 1924, Chimney Rock Mountains, Inc. purchased the old inn and surrounding property from Judge Logan's heirs. Soon this new development company had acquired over 8000 acres. Lure began in the spring of 1925. After construction of Lake Lure the main road was moved to the south side of the new lake. Logan's for the first time since it was built was not on the main thoroughfare. The inn continued to be used as the main office for Chimney Rock Mountains, Inc. until the Administration Building, one mile away and on the main road, was completed in 1927. Well-to-do people purchased tracts of land, built large homes and cruised the lake in large touring boats. Lake Lure was becoming a "rich mans playground". Then came the Great Depression. The lake's development companies went bankrupt and the land they owned was liquidated. During the Depression, the Inn and surrounding property was used to promote economic recovery as a Civilian Conservation Corps (CCC) headquarters. Workers from near and far came in search of a "New Deal job". Many of the dry-stack rock walls built at the sides of local roads were built by CCC workers. were created. In a brochure about 'Tally-Ho', the owners boast of having "City water, which is analyzed and approved regularly by the N. C. State Board of Health, furnishes the camp with an abundant supply". In 1946 Jim and Alice Washburn bought the inn. Alice, better known as 'Tootsie', was Judge Logan's great granddaughter. Jim and Tootsie renovated the existing guest cabins, built several more guest cabins, built several fishing and swimming ponds, started a large vegetable garden and the property was renamed "Pine Gables". The Washburns' once again followed the inn's tradition of catering to the travelers and tourists in the Hickory Nut Gorge. The present owners, Jim and Tootsie's grandchildren, continue to rent these cabins to tourist and other travelers. Dr. John Harris built at least one of the original log buildings that became known as the Harris Inn (the nominated property) in Chimney Rock North Carolina sometime between 1782 and 1800 on a tract of land he acquired during this period (one of the log structures may predate his ownership). Log construction was the predominate building style chosen by the earlier settlers because it was functional, needed no sophisticated tools and was the natural result of clearing land. As was typical of large log buildings of this area the logs were hand hewn flat on two sides and cornered with a half dovetail notches. The original two log buildings were built on either side of a large shared chimney and walkways from one log building to the other were constructed on either side of the chimney (see diagram on Continuation Sheet, Section 8 page 16). In ca.1834 the log structures were encased with boards and a large two story shed porch was added to the north side. Parts of this two story shed porch were later enclosed on the east and west ends (see diagram on Continuation Sheet, Section 8 page 16). It was in one of these rooms (at the first floor eastside of the porch) that the first post office to serve the Chimney Rock community (1843) was housed. For the next three decades the old inn apparently remained mostly unchanged. exterior facing walls were now eleven to sixteen inches thick. On the inside most of the dividing walls on the west side of the building were built using a unique one board thick design. These wallboards have decorative beading on both sides and were used where the walls were not needed for load bearing purposes. The massive granite stone fireplace at the first floor east living room was later built by one of Judge Logan's sons. The square cut granite rocks that face this fireplace are very large. The two support rocks, on either side of the fireplace opening, measure two feet long by three feet, three inches high. The principle rock on top of these support rocks measures one foot high by six feet, eight inches long. During the Great Depression the frame additions to the south were dismantled and the wood shake roof was replaced with metal sheathing. At this time the tearoom next door was enclosed and used as a residence. When, Mr. and Mrs. Riddick bought the inn and surrounding property in the 1937 the tearoom was converted to a dinning hall/infirmary, a small craft shop was built and the other buildings on the property were renovated. In 1946 Jim and Alice Washburn bought the inn. The Washburn's renovated the existing cabins and built several new cabins. house. Indeed there are no other historic buildings with a principle roof covered two story porch in this area and the inn is one of only two listed in Rutherford County. The nominated building is one of the two oldest inns and one of the oldest buildings in Rutherford County. In 1866 Judge George Washington Logan (1815-1889) bought the inn and it became known as the "Logan House". Judge Logan acquired both fame and notoriety during his lifetime. He was the son of John and Martha (Harton) Logan, and the grandson of the noted Revolutionary patriot Major Francis Logan (1734 -1826). As a result of his family background, Judge Logan developed a strong sense of loyalty to the United States. At an early age Judge Logan became active in the study of law and county politics. He served as Clerk of County Court (1841-1849), County Solicitor (1855-1856), member of the Confederate Congress (1863-1865), delegate from Rutherford County to the State Convention (1865) and Brigadier General of the Division of North Carolina Troops. From 1858 to 1861 he was the editor of The Rutherford Enquirer. From 1866 to 1874, Judge Logan divided his time between his home in Rutherfordton and the Logan House. During this time Logan was a member of the House of Representatives of North Carolina (1866-1874) and Superior Court Judge (1868-1874). On the bench he gained fame as an uncompromising foe of the Ku Klux Klan. Judge Logan's vigor to root out the Klan helped inspire charges of judicial incompetence. The Democratic legislature of 1871-1872 considered impeaching him, but ultimately declined to do so. In 1874 Judge Logan was defeated by one of his enemies and erstwhile Klansman, David Schenck. After this last election Judge Logan spent his last years at the old inn. � 1997-2014 Jim Proctor. All rights reserved. This web site is prepared and maintained by Jim Proctor. Please link here for our legal and privacy page.